Food Adventures of a Comfort Cook: Cookin' Cajun. Back on Saint Patrick's Day, I got a bit cheeky and wrote about Creole Cuisine instead of jumping onto the Irish bandwagon. Today I figured I would cover the other cuisine that is a staple of Louisiana, Cajun. Now while Creole is a hodgepodge of different backgrounds, Cajuns hail from their Canadian ancestors, the Acadians. So, what is the big difference between Creole and Cajun cuisines? Not much really, but the rule of thumb is: if it has tomatoes in it, it's Creole, no tomatoes, it's Cajun. However, that point is still debated today, even amongst the fine folk of Louisiana, and it's an argument I have no intention of getting involved in. 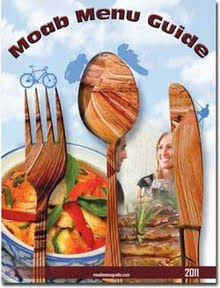 I just know the cuisines are good and that is all that matters to me and my taste buds. I was introduced to Cajun Cuisine by a former neighbor of mine, David Prudhomme, who happens to be a nephew of the famous chef, Paul Prudhomme. David, and his wife Sharon, own The Lost Cajun Kitchen located in Columbia, PA. This is where I first tried a dish that I never thought I would ever have, alligator. Alligator, if cooked properly, is tender, and I believe it tastes like shrimp. If you're ever in Lancaster County, PA, take the time to go to the Prudhomme's restaurant and judge for yourself. 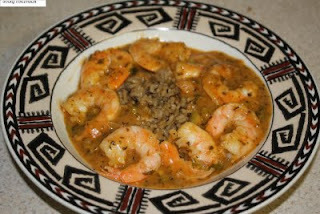 Here's my take on a Cajun dish, Etouffee, which means "smothered. Normally is it made with crawfish, but they are no where to be found in my area, so I used shrimp instead. Melt butter, over medium-high heat, in a large skillet; sauté bell pepper and onions until peppers are soft and onions translucent, about 10 minutes. While vegetables are sautéing, in a small bowl mix together flour, paprika, cayenne, salt, black pepper, oregano and thyme. Stir this mixture into the skillet and continue to stir as it bubbles to keep from clumping or burning. Add one cup of water and mix thoroughly; repeat with 2nd cup of water. Stir in parsley and garlic; bring to boil. Reduce heat to low, add in seafood, cover and let cook for 7-10 minutes, depending on seafood used.